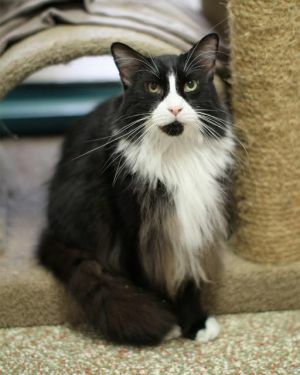 Is the Norwegian Forest Cat right for you? The Norwegian Forest cat is an unmistakably large breed with an impressive coat. The breed naturally developed on farms and near ports, and has a coat designed to survive Norway’s harsh weather. 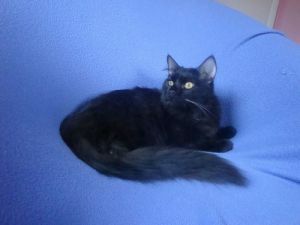 With their steady, easy going temperament and gentle affection, you’ll never want them far from your side, and the Norwegian Forest cat is happy to remain sprawled by the fire on cold winter nights. They enjoy companionship but this patient and even-tempered cat will not demand it of you. The Norwegian Forest cat is a fairly low maintenance breed, though their long coat will need the occasional brushing, particularly in the spring when they begin to shed their thick winter undercoat. They have a moderate activity level and will enjoy regular play time, but this isn’t a cat to tear the house apart in boredom when you’re gone. Adaptable and friendly, they make a good addition to many kinds of households. The Norwegian Forest Cat is large cat with a sturdy build and a considerable coat. This is a cat that is both big-boned and fluffy! The body is moderate in length, broad chested, and solidly muscled. The legs are average in length, sturdy, and the feet are large, round, and tufted. The tail is at least the length of the body and quite bushy. Atop a muscular neck sits an evenly proportioned, triangular head. The muzzle is average in length, and the chin is strong. When seen in profile, the Norwegian Forest cat has a long and straight nose from brow to tip. The ears are large with a wide base, slightly pointed, and may be quite furry with lynx tips and long hair coming from the edge of the ears. The eyes are large and almond-shaped with a slight slant. The Norwegian Forest cat may have eyes of any color, though blue or odd-eyed is only accepted as standard for white or mostly white cats. The coat of the Norwegian Forest cat is semi-long with a dense undercoat. The top coat is smooth and water-repellant, while the undercoat is thick and wooly. Ears and toes are tufted, and the tale is full and busy. 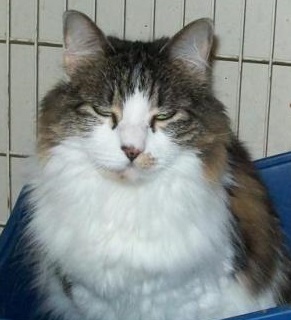 The Norwegian Forest cat may have a considerable neck ruff and britches. They may come in all possible colors and patterns though some breed registries do not accept chocolate, sable, lavender, lilac, cinnamon, fawn, or points. The Norwegian Forest is largely a healthy cat, though there may be an increased incidence of kidney and heart disease. DNA tests can detect the disorders commonly responsible, and many breed registries require breeders to test their cats before registering them. Because of their size, the Norwegian Forest may also be more prone to hip dysplasia. The Norwegian Forest cat is a friendly, intelligent, and social cat. These laid-back giants enjoy affection and attention, but aren’t demanding or clingy. They enjoy being an unobtrusive companion, following you from room to room but giving you your space. The Norwegian Forest is a cat who can easily go with the flow, and is readily adaptable to different environments. They do well in homes with children, being both gentle and patient. They tend to get along well with other pets in the household. While not a couch potato, the Norwegian Forest cat is not an overly active breed. He does enjoy climbing, and this strong cat may impress you with his ability to reach new heights. They enjoy playing and are intelligent enough to be taught tricks. Because of their history, the Norwegian Forest cat is a keen and effective hunter so you’ll probably never have to call the exterminator again! Zorro was my childhood pal. As a kid, I lived on the countryside, which is a perfect environment for a Norwegian forest cat. He had a very “catty” personality, and liked to stray off for a couple of weeks now and then. When he eventually came home his long beautiful fur was ruined. His body was covered with big hair lumps impossible to brush out, so my mom had to cut them off and he would look pretty rugged until his fur grew out again. Anyway, Norwegian forest cats are “talkers”, they can have really strange sounding monologues that will give you goose bumps if you are caught off guard. But don’t be alarmed it’s only your long haired Norwegian pal who wants to cuddle! I almost forgot that they are huge, so if you live in a tight apartment you should think twice before inviting a “mini-lynx” into your home..